Say Hello! to Bon Mot! Kick back and spend a few fun minutes (or hours!) 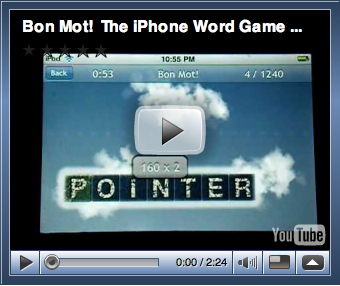 with Bon Mot, a new word game for the iPhone and iPod touch. Bon Mot is easy to learn, and provides new challenges with every game. You have two minutes to unscramble as many 7-letter words as you can. When you finish one word, just tap the score button and a new word drops from the sky, ready to unscramble. If you can’t figure a word out, either double-tap to get a new word, or spell a shorter word to earn partial points. And that's where your strategy begins! Should you try to unscramble the entire word? skip it and move on? or can you improve your score by quickly spelling shorter words? Watch your score increase as your ability to unscramble or find the word within grows. Submit your highest scores to the Bon Mot Hall of Fame to see how you compare with other players in the wide world of Bon Mot! The Origin of Bon Mot! What do you get when you mix an iPhone, an iPod touch, an out-of-work radioman, and a laid off programmer? That's what we wondered... and now we know. What you get is... Bon Mot! Kenny Smith is a long-time software engineer and short-time founder of The App Orchard, a nifty new company dedicated to creating fun, novel software for the iPhone and iPod touch. When not programming, Kenny can usually be found doing other programming, or blogging about programming. Occasionally he turns off his computer and pretends to be a carpenter or reads a good book. William Lindsey Cochran is the name that Chicago radio personality Bill Cochran goes by when he wants to stretch his creative wings and fly far beyond the bounds of mere audio production. Bon Mot! is his first foray into creating an iPhone app, though in his time he has also dreamt up a handful of fun and useful widgets for the Yahoo! Widget Engine.